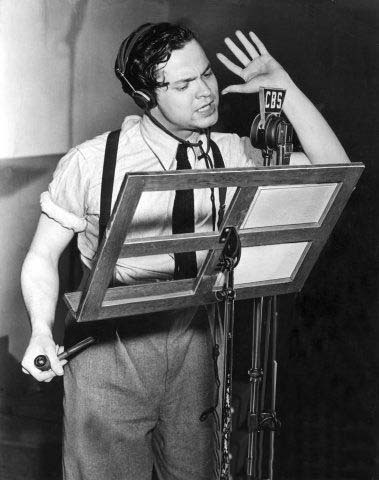 I heard the original broadcast of “The War of the Worlds”, as a 17-year-old freshman at the University of Texas. Then, it wasn’t necessary to add “at Austin”. I was in a diner near the campus. People stopped talking, then stopped eating, as they listened. I went onto the campus and sat by the famous fountain, uneasily waiting for something ominous to show up in the sky. Nothing did. I then went to my rooming house and phoned the “American-Statesman”, asking if they had any unusual news on the wire about an event in New Jersey. A young woman told me no. Then I turned on the radio and heard the last of the program, Welles telling people that it was all a Hallowe’en prank. The next day we read of panic in the East, people fleeing, etc. The news story lasted for days. Is that radio boadcast of War of the Worlds royalty free? If something is in the public domain can one simply just use it? are the pics you used copyrighted or public domain? I was wondering if you could answer this question for me – could I use some clips from this recording in a theater piece, kind of interspersed as voiceover throughout the play? Is that considered fair use if something is public domain? Thank you for sharing your knowledge about all of this stuff. I was really surprised to be reminded of how exciting this broadcast must’ve been to those very first listeners who heard it. I heard about this event when I was a little kid, but never gave the recording a real listen until recently. Thank you, Internet. Hello! I am making a podcast about extraterrestial intel·ligence, and I’d like to use a fragment of this mp3, as I will be talking about War of the Worlds. Is that possible or are there rights involved?